The last month has truly been a whirlwind of so many different changes, wonderful and memorable experiences, and many lessons learned. I moved from Medellín to Bogotá a little more than a month ago, and am now feeling really settled and at home here. It was truly a great feeling to move into my new apartment and be able to finally unpack my bags again (hopefully for the last time for a long while!). Aside from missing Medellín’s efficient transportation and comfortable size, I am really enjoying life in Bogotá and my work at this office has been going very well. This past weekend I returned from nearly a week of fieldwork in a southern department of the country called Caquetá. The department sits on the edge of the Amazon and is wonderfully hot and suffocatingly humid. The scenery of the whole area is just breathtaking. Every inch of this country that I’ve seen so far is amazingly beautiful. One thought that kept creeping into mind as we travelled through Caquetá’s countryside, though, is that it’s hard to believe when looking at the gorgeous, lush mountains and pastures that so much of the seemingly serene landscape is home to guerrilla camps and is littered with all kinds of remnants of war. It definitely casts a somber shadow over the beauty of the country. As for the work, we had many objectives for our week in the area. These ranged from assisting with the medical assessment of victims, to conducting monitoring and systematization of victims’ experiences, to following up with CCCM volunteers who run Mine Risk Education (MRE) workshops in the rural areas of Caquetá. It was a truly valuable opportunity to meet and talk with landmine survivors, assist them with accessing their rights, and to meet with volunteers who take a big risk in training community members in MRE amidst the conflict. We went to a number of rural communities – San Vicente del Caguán, Puerto Rico, and Lusitania. CCCM has volunteers in each of these communities who have been trained in delivering MRE workshops and who do this on behalf of CCCM with school children, community members, and their families. We were there to interview them about their experiences, as the project (conducted in partnership with UNICEF) is wrapping up in a few months. Overall, their experiences seem to have been quite positive, and community members very receptive. It was shocking to discover how little rural inhabitants really know about the real danger of their surroundings in relation to the conflict until people like our volunteers provide MRE workshops and the likes. We also heard from a number of volunteers that guerrilla leaders had approached them after hearing about the MRE training and would question them; asking them who they are, what they’re doing, etc. The guerrillas then warned our volunteers that they could continue training on prevention, but not to get involved in any way. I really began to understand just how much the presence of guerrilla control is felt in these rural areas and how much it is a daily reality with which they must learn to live. In Florencia, the capital of Caquetá, we assisted with a medical assessment conference for victims from all over the department. The conference was organized to aid survivors in accessing their medical rights under the Victim’s Law 1448 of 2011. Many landmine survivors are not educated or are simply unaware of the rights that this law assures them; for example, a prosthetic leg costs nearly a year’s salary for a rural farmer, but the State is actually responsible for covering this cost if the survivor is officially recognized as a victim of the conflict with the State. Many who attended this conference needed their prosthetics replaced, more surgeries, or to see specialists about ongoing health effects from their accidents. While the victims waited for their appointments, we had set up an interview setting in the hospital where colleagues and myself interviewed the roughly 60 survivors about their experiences from the time of their accident and on. This was largely for monitoring and systematization of CCCM, but also so that we can have accurate information to report to the State to hold them accountable to their responsibilities under the Law 1448. These interviews were truly the most memorable, valuable and difficult experiences I have had so far in Colombia. I formally interviewed roughly 15 victims and had many opportunities to talk with the others while they waited for their medical appointments. It’s difficult to even begin to sum up how much of a more in depth, personal perspective I gained about the conflict from these interviews. The honesty and raw emotion that the survivors shared with me was touching and also heart wrenching. I learned that many victims suffer severe depression and a number who attended the conference have attempted suicide multiple times. 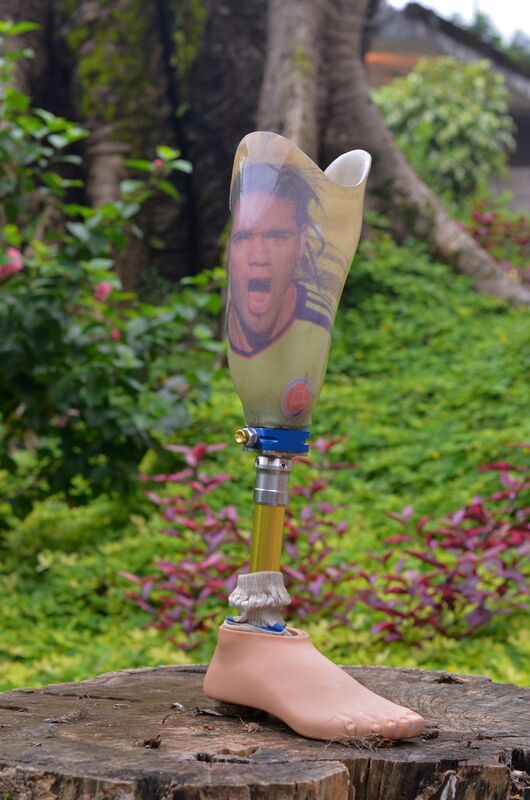 One gentleman with whom I spoke lives alone, has no support, and has had a very difficult time getting his prosthetic, as his initial surgery was not properly done and he needs another before he can be fitted for a prosthetic. I had also noticed a striking difference in the kind of injuries that victims in Caquetá seem to have compared to other victims I have worked with. In Antioquia, victims had a variety of injuries – hands, arms, vision, skin lesions, etc. Whereas in Caquetá, the majority of victims have not had vision loss and most have at least one if not bilateral amputations of lower extremities. I mentioned this observation to a colleague, and I was told victims in Caquetá have the most amputations out of all victims in the country. This is due to the fact that almost all explosives used in the department are landmines, whereas in Antioquia, for example, a much wider variety of explosives are used. Many victims also expressed the challenge of being from a farming background and feeling that they have been stripped of their ability to generate income by not being able to do manual labor anymore.What shocked me probably the most of all was when multiple survivors told me that after their accidents, guerrillas came to their farms and threatened them. The guerrillas apparently demand a fine of roughly 2 million pesos from many landmine victims, because they stepped on “their” landmine which was meant for the military; essentially saying that the innocent civilian messed up the plan. There are so many things that enrage me about this. First of all, 2 million pesos is more than a rural farmer would earn in almost a year, and if it is not paid, the guerrillas forcibly displace the family. Second, the values on which the FARC and other guerrillas base their movement are supposedly precisely for the peasant farming population; to regain popular power and restore the people’s rights. It is shockingly evident just how far the movements have strayed from these initial motives. The one survivor case that really struck me was that of a man named José. He is from the countryside, and like many others, has always lived on a farm, doing manual labor and living closely with his family. In September of last year, he was working in a gold mine in a rural area of Nariño. The night before his accident, there had been combat between paramilitaries and guerrillas all around his community. The next day, he was walking on the typical path heading home from the gold mine, but stepped off into the bush for a moment to go to the bathroom. As he was walking back towards the main road, he took a narrow, wooded path and stepped on a landmine. His work friends had continued walking up ahead, but turned back to rescue him when they heard the explosion. He said he then spent 4-5 hours in a makeshift boat to be transported to a bigger centre, Tumaco, Nariño. When he arrived, the military met the boat at the port and transported him to the health centre. 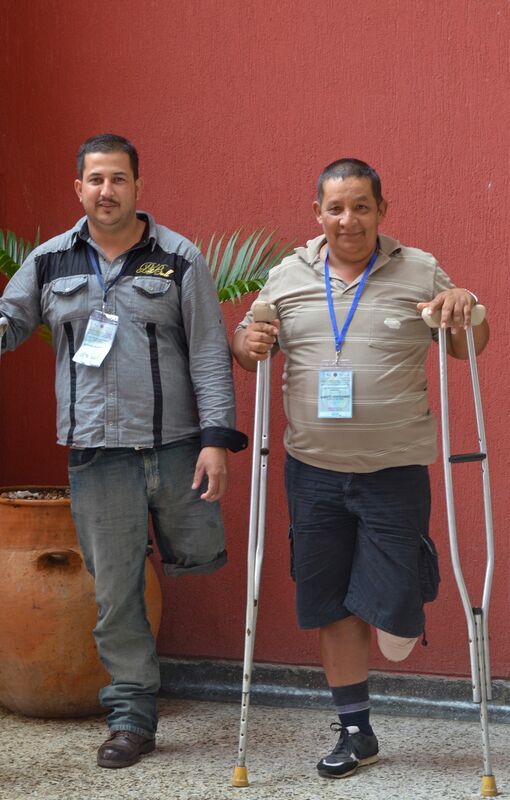 In Tumaco, they amputated his left leg above the knee, as it was in very bad shape. 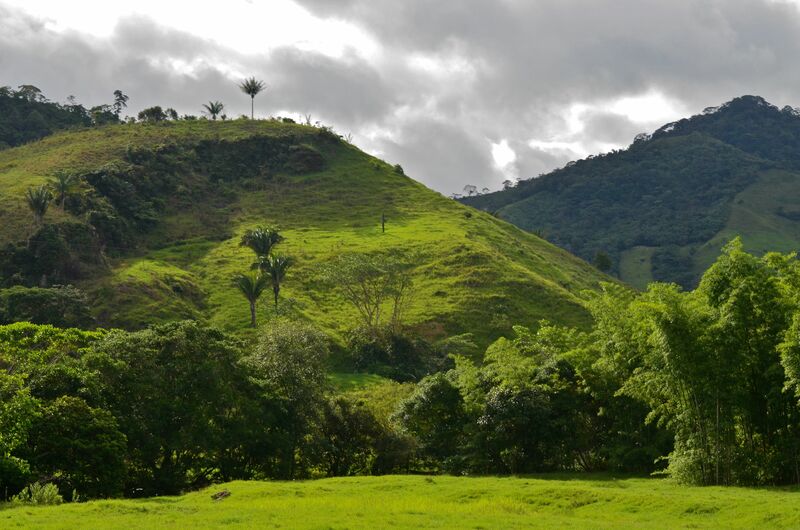 He was later transported to the capital of Nariño, called Pasto. There, his right leg was also amputated above the knee. 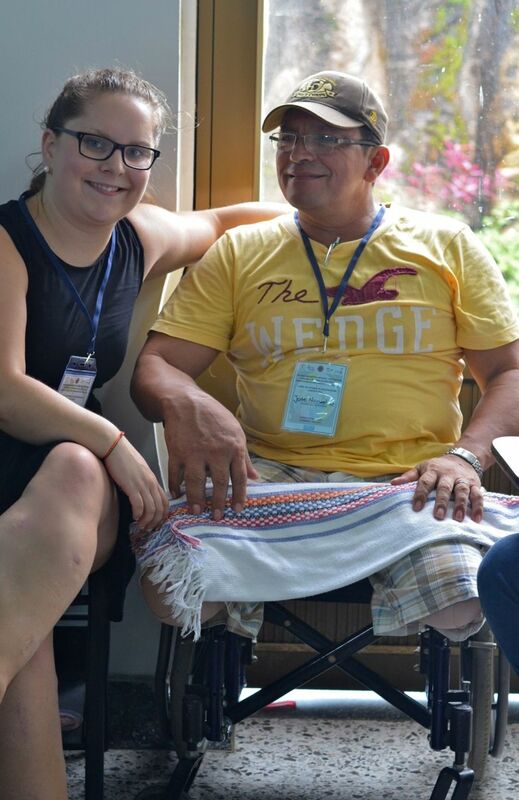 As José relayed his story to me, he kept repeating that he never should have had to lose both his legs. He said that the medical professionals who attended to him had been negligent. The injuries to his right leg were apparently relatively minor, but no one attended to him, and particularly to that leg for so long, that it was too late to save it by the time they got to it. It was evident that this was still a very hard reality for him to deal with, as he told me that for a farmer, for someone who loves to get on his horse and do manual work, his life could have carried on much differently if he had been able to keep at least one of his legs. José’s case is also a very challenging one, as the official story of what occurred was changed in his hospital files when he arrived at the first medical centre. This was because his coworkers from the mine and the hospital staff were afraid to report the incident as guerrilla activity. Instead of reporting what was clearly a landmine incident, it was written that it had been an accident at the gold mine. Due to this, he has experienced innumerable challenges with the legal process of his case, with being officially recognized as a victim of the conflict, etc. He has received zero support from the State, because of not having official status as a victim of the conflict, so the State claim to have no responsibility to him. He has paid out of his pocket for his wheelchair, physical rehabilitation, and psychological support and was forced to displace his family in order to access better health services. He couldn’t dream of affording two prosthetic legs without support from the State, so he is confined to the wheelchair until and if his case gets worked out. This was a very difficult story to hear, and brought up so many emotions. I can’t imagine the patience, strength and positivity that it takes to get through the challenges that José has and will continue to face. The whole week was very emotionally charged and the work was intense, but these experiences with victims are what I have valued most about my time in Colombia. Now I’m back in Bogotá, but preparing for another monitoring and evaluation trip with Marie-Josée next week to Neiva, Huila. I’m really appreciating the work that we get to do on these trips.